Veric Tan (Class of 2015) has been awarded the Outward Bound Singapore (OBS) Leadership and Service Award for 2016 on 19 November. As a student in SJI, Veric was from the Uniformed Group. He participated in the ACE Camp in 2012. This was the first ACE Camp where we used Secondary 2 student leaders. The following year, Veric signed up for the Endau Rompin Expedition and he was also an ACE Leader in Secondary 2. He continued to serve as ACE PSF in 2014. Veric was keen to learn the "eskimo roll". He signed up for courses on his own but had not pick up the skill. He used his free time at ACE Camp to practice and with a little guidance, he managed the roll during ACE 2014. Eight student leaders from Secondary 3 and JC 1 represented SJI at the 9th S Rajaratnam Lecture on 11 November 2016. The lecture titled “A Sense of Self in an Age of Globalisation” was delivered by Mr George Yeo, an SJI alumnus from Class of 1971 and former Minister for Foreign Affairs. In his speech, Mr Yeo addressed the idea of how human identity is dynamic and can be found in various aspects. He also touched on the role of ASEAN in a global context and highlighted the importance of accepting and celebrating our diversity as Singaporeans because Singapore is ultimately an idea worth living and fighting for. Following the lecture, our students had a chance to engage in conversation with Mr Yeo and Dr Vivian Balakrishnan, Minister for Foreign Affairs. Mr Yeo and Dr Balakrishnan were happy to address the questions raised by our students, with their responses focused on the complexity of the world we live in today. SJI fathers and sons bonded over a game of bowling on 15 October, to bring sons and fathers together to know each other better. The interaction between classmates and parents resulted in stronger bonding for both friends and families, bringing them closer and helped them to know each other better. “Last Saturday morning, I was one of the fathers who attended the father and son bowling games. I will say that the bowling achieved its aim of strengthening the bond between father and son - most of the boys were very excited to compete with their fathers especially Raphael who started with better points than mine. He was very determined to show he is also growing to become a man while I happily praised and cheered him to go on, but reminded him that if he slacks I will be very happy to slide past him. The laughter, anxiety, concentration and seriousness to throw perfect balls all combined to make it fun; both father and son teaching each other the technique to achieve the best hit cordially. I have played soccer with my son on several occasions so we have a cheeky way of poking fun at each other without being sensitive about it. Looking at the other fathers, it was obvious that they are all having fun with their wards too, and sometimes they join in short intermittent conversations the kids have with their classmates. Initially, I thought two hours might be a bit too long but at the end it was not enough! This get-together also helped us see and put a face to some of the names of their school friends the kids chat about at home - my wife was quick to connect to the name of one of the boys. We had fun (fathers and sons), and will not think twice to attend again if anything like that is arranged. Kudos to SJI for coming up with this great idea; a relationship between father and son is not something that is free willy. Being males, often we like to keep to our own corner and little disagreement often bring about misunderstanding or clashes. Our secondary boys fared well at the Science Junior Olympiads this year. Tran Nguyen Manh Dan and Le Nguyen Nguyen Khoi, both from LE403, attained the Gold Medal for both Chemistry and Biology Junior Olympiad 2016. Tran Nguyen Manh Dan also achieved overall 1st position for Chemistry Junior Olympiad. Le Nguyen Nguyen Khoi also attained a SILVER medal for Physics Junior Olympiad. The Speech & Graduation Ceremony marks the official end of our boys' four-year secondary education at SJI. Mr Benedict Cheong (Class of 1975) was our guest of honour at the ceremony. Joshua James Chong (ML301) won 1st in the 3m Secondary Men Event at the 6th Singapore Inter-schools Diving Championships 2016, held on 24 September. Bryan Lim Jun Hao is one of the top seven award winners from Ngee Ann Polytechnic’s cohort of 5,257 students this year. He graduated with a Diploma with Merit in Business Studies, and was awarded the Ngee Ann Kongsi Gold medal and Lien Ying Chow Gold medal for being among a select group of graduates who have demonstrated all-round excellence. Bryan will be pursuing a Degree in Law with Honours at the National University of Singapore. The Diploma with Merit is awarded to the top 10% of the graduates in each cohort. The Ngee Ann Kongsi Gold Medal is awarded each year to the most outstanding graduate from Ngee Ann Polytechnic. The Lien Ying Chow Gold Medal is awarded to the most outstanding graduate from a non-technology course in Ngee Ann Polytechnic. Lau Jun Hao Benjamin graduated with a Diploma with Merit in Information Technology, and was awarded the Microsoft Gold Medal & Prize, Motorola Prize and the NCS Prize. Benjamin also attained a Certificate in Advanced Computing Mathematics. Goh Peng Hau graduated with a Diploma with Merit in Mechanical Engineering. He was also awarded the Lim Teck Lee Silver Medal & Prize, Bosch Rexroth Prize and ST Kinetics Prize. Peng Hau also has a Certificate in Advanced Engineering Mathematics. Chua Zhuang Yu graduated with a Diploma in Banking & Financial Services. He was awarded the Financial Women's Association of Singapore Prize and and a Certificate in Quantitative Methods & Economics. Christopher Quek Wen Jun graduated with a Diploma in Molecular Biotechnology and he was also awarded the Sartorius Stedim Prize. Manfred Tham Meng Kit graduated with a Diploma in Mass Communication and he was awarded the Singapore Press Holdings Prize. The SJI Chamber Ensemble brought classical music to life! SJI is home to many talents. The lunchtime concert is one of the platforms that Josephians have to showcase their capabilities and to appreciate each other’s talent. This year, we were privileged to have a few acoustic bands, dance groups, Vocapella, the Chamber Ensemble and a series of solo pianists and guitarists to perform on this stage. The repertoire consisted of many genres, from classical to rock music. One of the highlights was a skilful Yo-Yo performance presented by Gabriel Yong (JC104), in which the audience cheered loudly for. The Chamber Ensemble proved that classical music is neither boring nor obscure, as the audience swayed along the rhythm of the melody. Many were also impressed by the heartmoving modern dance presented by Clarice Wong (JC105) and Rachel Ng (JC108). So, what is this concert about? After the stunning performance by the Vocapella, I was touched to find out that they were not professional singers. Everybody worked hard to perfect their harmonies during countless lunchtime and after-school rehearsals. I came to realize that this is neither a competition, nor a simple showcase of skills. It is about doing what makes our hearts sing; it is about the joy, the commitment and perseverance that motivates us to go beyond our current abilities. These performances ended on a high note with our celebration of Teachers’ Day. On this day, we celebrated and expressed our thanks to our dearest teachers through various performances, just as the performers spread the joy through music and dance. At the root of all great literature lies the power of imagination, yet we know so little and miss out on so much. As self-confessed newcomers to Literature, we were both curious and apprehensive about the seminar and the unknown world that lay ahead of us. The Gifted Education Branch (GEB) Literature Seminar was held on 27 August at Raffles Institution. The first item on the agenda was the concurrent literary sessions conducted by literary academics and writers. Mr Connor’s take is that ‘Literature is something that you would want read over and over again’. During the workshop, he introduced us to songs from the1600s to the present, taking us through the possible meanings of the lyrics on their own and then together with the set music while we took turns to share our opinions. After analysing the lyrics, we understood Mr Conner’s words of wisdom: Literature does not just tell us to think, it invites us to do so. Literature is something that we will read, watch, listen to and experience over and over again to gain new perspectives and insights. Lyrics can be considered literature as they are not mere words on a piece of paper, but thought-provoking creations empowered by their context and how they resonate with us. After these revelations, we proceeded to the student presentations. In our opinion, the highlight of the seminar was the presentation by Jay Parmar, Andrew Snodgrass and Ryan Woon of LE402 on the macabre in fairy tales. We especially enjoyed how they explored the relationship between the macabre and societal norms of the past and the present. Their presentation was highly engaging and provoked many questions from the audience. All in all, the seminar did not just open our eyes to different forms of literature and understand them better; it also allowed us to develop a deeper appreciation for Literature. The YMCA Plain English Speaking Awards (PESA), held on the 24 August 2016, is a national level oratorical competition, aimed at developing students’ abilities to think and communicate effectively. Participants in this competition are put through a gruelling contest of speeches – both prepared and impromptu – before they can qualify to compete in the finals, a contest of the best speakers in the country of their respective age groups. Martin Inglin from the class of LE102 represented SJI for the lower secondary level. Martin delivered a speech entitled ‘What’s the D ifference?’ that was about the time he had spent with a teenager with special needs. It was a breath of fresh air after the audience had listened to a number of somewhat repetitive speeches by the earlier participants. In the Impromptu category, Martin had to talk about how he would see Singapore in 50 years. With only minutes to prepare the speech, he waxed lyrical about his technological and sporty vision of the future that would change Singaporeans’ lives for the better. His sincerity and passion was evident as he articulated his thoughts aloud. When the dust settled, it was announced that he was placed 3rd in the competition. Against the incredible competition, it was a very close battle. It was truly a hard fought victory. Martin’s whole class, LE102, his form teachers Ms Lee Siew Lian and Ms Tan Lay Moi, together with Mrs Denise Jeyaseelan and Mr Soo Chan Hua, were at YMCA to support him. It was a long afternoon for the students of LE102 but watching speaker after speaker perform, they gained valuable insight into the art of speaking as they waited for Martin to speak and for the eventual results. Their presence certainly elevated this event into more than a student’s attempt at winning a competition. It was the spirit of SJI in action. On 18 August, the Ministry of Foreign Affairs organised the ASEAN Day Reception. The event was to commemorate the establishment of the Association of Southeast Asian Nations (ASEAN) on 8 Aug 1967. This year, SJI was one of the schools invited to attend the 49th Anniversary Celebrations. Alphonsus Yong, Neil Bhargava (both ML404), Jerome Tan (TG106) and Pooja Bhagwans (TG107) together with Mr Genesius Chan attended the reception at Marina Mandarin. The event was graced by Dr Vivian Balakrishnan, the Minister of Foreign Affairs. His opening address touched on the role that ASEAN has played over the past 49 years, and their potential for future growth. He also stressed the importance of ASEAN to Singapore's development as a country. 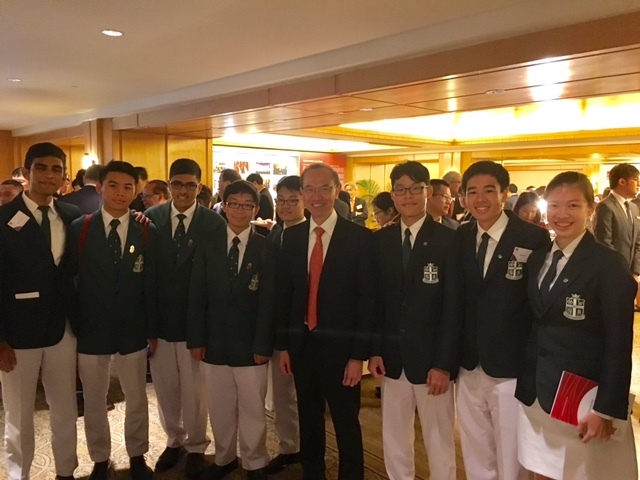 While providing a chance for us to meet students from other Secondary Schools and Junior Colleges, the reception also gave us a unique insight into the importance ASEAN continues to hold for Singapore. Even as Singapore continues to develop its global standing, it is vital that we strive to build relations with countries in our own region. Two teams from PRISM, the Social Entrepreneurship Club of SJI (Senior section), pitched their business strategy in the final round of the 2016 Raffles Business Symposium on 12 August. The competition is organized by the Raffles Entrepreneurs Network and the theme is “Entrepreneurs in a World of Conglomerates’’. The two teams competed against other schools like RI and ACSI and eventually won the 1st and 3rd place in the Finals. Team Velocity was interested in improving healthcare for Singapore’s rapidly ageing population. Their solution was ‘Smart Assistive Monitors’ (SAM), a multifunctional medical tracking device used to monitor the health of elderly patients. Represented by Yong Zheng Yew (JC104), Teoh Le Yi (JC109), Hrishikesh Harish Pai (JC104) and Gerard Christopher (JC109), Team Velocity retained the championship title for SJI and emerged 1st place in the competition. They received a cash prize of $500. Team Metamorphus tackled the lack of fitness in Singaporeans through the personalized and highly customizable platform ‘Dr. Life’, which integrated meal planners and fitness trackers into one comprehensive tool. Based on three key pillars (Diet, Exercise and Sleep), they aim to cater a one-stop service to everyone who is keen to achieve healthier living. They clinched the 3rd placing with a cash prize of $100. The members are Raphael Chua Wei Ming (JC104), Juan Tan Zng Tze (JC105), Sheares Toh Xue Wen (JC101), Gabriel Yong Zhe Rui (JC104). We also congratulate Mrs Vivian Tan, Head of Department for Arts/Aesthetics at SJI, for being awarded the Commendation Medal! “Running is a lot like life. Only 10 percent of it is exciting. 90 percent of it is slog and drudge.” - Dave Bedford. On 8 August, Josephians arrived at Sengkang Riverside Park in the four fraternity colours of Fintan, Marcian, Michael and Lawrence for the annual SJI Cross Country. They ran a distance of either 3.6km or 4.2km depending on their age group, and pushed themselves to do their best while motivating their friends to persevere and clinch this year’s finisher’s medal. The Secondary Two Catholic boys set out on a pilgrimage of the five Holy Doors of Mercy in the archdiocese on 6 August. This was one of the activities in the school’s Religious, Moral and Social Education (RMSE) programme this year to coincide with the “Year of Mercy”. Accompanying them on this pilgrimage of five parishes were the school chaplain Friar Michael D’Cruz, OFM, and seven Franciscans in formation - Friar Robin Toha, Friar Cosmas Yassun, Friar Gerald Tan, Friar Gerald Saimel, Friar Aiden Peter, Friar Sixtus Pitah, and Friar Crispus Mosinoh. At each parish, the boys were introduced to its history and the story behind its name. It is a happy coincidence that four of the parish priests at these Churches were former students of SJI. The first stop at the Church of Divine Mercy saw Fr Johnson Fernandez sharing about St Peter. He is depicted as the rock of the Church and as having the keys to the doors of heaven. The Church was named after the patron saint of Divine Mercy, St Faustina Kowalska, who died in 1938. The friars led the boys through a paraliturgy based on the Parable of the Prodigal Son and his brother, and taught them to pray a decade of the Chaplet of Divine Mercy; the remaining decades were prayed at each of the other parishes. At the Church of the Sacred Heart, alumnus Fr Stephen Yim welcomed the boys at this parish that sits in the heart of the city. Here, the boys learnt about St Margaret Mary Alacoque and the image of the Sacred Heart, which the parish is named after. The friars shared the story of St Francis of Assisi (founder of the Franciscan Friars) and the leper, which was one of the defining moments of Francis’ conversion. His embrace of the leper shattered his social aspirations and inspired him to not merely care for the poor and outcast, but to live among them as one of them. His motivation was always his great attitude that Jesus Himself did not cling to His divinity, but became human like us. The boys then spent some time to reflect on their weaknesses and struggles, and the gifts and strengths that the Lord has blessed them with. These reflections were then offered up to unite them to the heart of Jesus. The pilgrimage then moved on to the Church of the Holy Cross in Clementi. The friars shared about the meaning of bearing the crosses in our lives through the story of a boy called Mattie J T Stepanek. Despite suffering from a rare and fatal neuromuscular disease called Dysautonomic Mitochondrial Myopathy, Mattie embraced life and lived in hope, peace and love during his short 13 years of life. The boys then crossed over to the Church of St Vincent de Paul (SVDP) where another SJI alumnus is the parish priest. Fr Michael Sitaram welcomed the boys to the parish. The friars shared the story of St Vincent de Paul, a French priest who was known for helping the poor. They challenged all those present to think about their own actions and how they can better help the poor and needy in their own ways. In his reflection, Friar Michael D’Cruz said: "Some people are ‘in jail’ (though not physically) because we have jailed them with our judgement... Some are poor (in character) because they didn't have a good foundation... St Vincent de Paul asked us to show care and mercy to them." The pilgrimage concluded at the Church of the Risen Christ in time for the sunset Mass. The boys presented a Thank You card to the Franciscan Friars for guiding them through the five Holy Doors. This year marks the centenary of the Easter Uprising, a pivotal event in Ireland's history and one that has become synonymous with the creation of the Republic of Ireland. With this in mind, SJI students were fortunate to be visited by Ambassador Geoffrey Keating, the Irish Ambassador to Singapore. He regaled the students with a tale of the myth and reality of 1916 as well as its role in the independence movement in Ireland and the decolonisation process in general. He also generously fielded questions from the students on more current events, particularly the likely impact of Brexit on Ireland. We thank the Ambassador for generously giving his time and for this opportunity to build international mindedness in our SJI students; something that was grabbed with open arms by the students. Alumnus Ng Run Hong (Class of 2012) is the top graduate from Nanyang Polytechnic’s School of Business Management (SBM) this year! With his stellar academic performance – a GPA of 3.99, including 25 Distinctions and 5 ‘A’s, Run Hong topped his 2016 cohort and was awarded a Diploma in Banking & Financial Services. He also received the DBS Award for being the most distinguished graduate from SBM, and the Standard Chartered Bank Gold Medal, in addition to the Standard Chartered Bank Book Prizes he received in his first and second year in NYP. During his four years in SJI from 2009 – 2012, Run Hong was an outstanding cadet with the St. John Ambulance Brigade (SJAB). He was presented with numerous awards by SJAB, such as the Best Recruit in Secondary 1, the Outstanding Trainee from the Basic Leadership Training Course held at HQ in Secondary 2, as well as the Outstanding Cadet in Secondary 3. He was the Company Sergeant Major, and also held the appointment as a Team Leader for his SJAB Competition Team. Alumnus Kenneth Sean Teo Hao Jin (Class of 2012) was named Soldier of the Year 2016. Kenneth was the deputy Head Prefect in 2012, and was one of the Lasallian Distinguished Service Award winners that year. During his time in SJI, he was an an active member of the SJI Tennis team and a committee member of a service group, the Legion of Mary, in which his role was the Treasurer. Kenneth’s capacity for leadership was noticed since Secondary 1, when he was appointed as a Junior Prefect. He was trained as a Peer Support Leader (2010) and later as a Peer Support Facilitator (2011); helping to mentor and later oversee the running of the Secondary 1 Orientation Camp. Appointed as the Deputy Prefect in 2012, Kenneth worked closely with the student body to initiate various school-wide projects. Recognising the selfless service and contributions to the school over four years and for having been an exemplary witness to the values and ethos of the school, Kenneth received the Lasallian Distinguished Service Award (2012). The SJI Counselling Team, together with our school’s Triple P school coordinator, Ms Ellen Tandean from the SJI Parent Support Group (SJIPSG), organized a parenting workshop for our lower secondary parents. The SJIPSG conducted three sessions of the Triple P from July till August, which was attended by about 200 parents. This is the second year SJI is running this programme for its parents. The Triple P (short for Positive Parenting Programme) is one of the world’s most effective parenting programmes. Developed by clinical psychologist Professor Matt Sanders and his colleagues at Australia’s University of Queensland, Triple P has been proven to work with hundreds of thousands of families through ongoing research over 30 years. More than 230 published papers, international trials and studies have shown it works across cultures, socio-economic groups and in many different family structures. Triple P is designed to give parents the skills they need to raise confident, healthy children and teenagers and to build stronger family relationships. Triple P does not tell people how to parent. Rather, it gives parents simple and practical strategies they can adapt to suit their own values, beliefs and needs. The benefits can be dramatic and long-lasting. Parents who attended the talks have found it useful and informative. They look forward to more of such seminars on healthy parenting tips. Led by Peer Support Leaders (PSLs) from SJI and Raffles Girls School (RGS), the Peer Support Sharing (PSS) on 23 July was a great opportunity for students from 14 schools across Singapore to share Peer Support ideas and work towards growing their communities. The event titled ‘Diversitas: Innovate, Integrate, Inspire’ aimed to incorporate the values of diversity and acceptance in a community and hoped to motivate PSLs to work towards building an accepting and diverse society where students can strive to work with each other and for each other. Activities throughout the day were strategically planned to instil values such as teamwork, sacrifice, perseverance, creativity and friendship. There were also ample opportunities for students to share Peer Support ideas from their own schools for others to learn from. The first major activity was a mass icebreaker where students wrote questions onto a paper airplane and threw it across the auditorium, for somebody else to find. The person who picked up your airplane would have to find you and answer the questions. This icebreaker gave each person an opportunity to meet a random person and be confident in opening up to them. Other icebreakers were conducted in groups to allow the members in each group to know each other better. The most anticipated activities were the games which included an amazing race and a game of Capture-the-Flag. These encouraged teamwork to bring each group closer together. Bonding through games is important in each society as it supports community-building in a fun way. A workshop by Ms Vadivu Govind taught the participants about the value of diversity in peer support. Through the movie ‘‘Finding Dory’’, the participants discussed and shared about diversity in their everyday life and how it can be related to them as a PSL. One of the last major activities was a scenario sharing session where each group was given a scenario and asked to discuss how they would overcome the stated problem by thinking out of the box and using what they had learnt. Just like all other events in SJI, the PSS ended off with reflections and debrief followed by the prize presentation and closing address. Through PSS 2016, many new friendships and bonds were formed. It is the wish of the organising committee that all participants would be able to innovate, integrate what they have learnt and to inspire each other when they return to their respective schools. On 22 July, Josephians and teachers came dressed in their unique ethnic costumes and SJI was transformed into a mosaic of vibrant colours - all in celebration of Racial Harmony Day! The school bustled with activities as the Parent Support Group and the Indonesian and Vietnamese student scholars sold a wide assortment of traditional snacks unique to each race. All the proceeds went to the SJI Meal Voucher Scheme to assist needy students. Josephians and teachers also gathered at the amphitheatre to enjoy a locally produced movie. It was truly a memorable day where our multi-racial Josephian community came together to celebrate our history and culture! 20 lower secondary students listened attentively to Julia Lawrinson, a young adult fiction writer from Australia who shared her journey as a writer. She has to date published 12 books for children and young people, including The Flyaway Girls (2015) and Losing It (2012). For the workshop had up her sleeves a host of ideas to stir one's imagination - from a simple one of creating stories from a group of random words to that of developing a character from pictures and scenario setting. The one-and-a-half hour session on 19 July helped the boys to 'limber up' and allow their imagination to go on over-drive. The writing session concluded with yet another high point where each participant went home with an autographed "Near and Dear", an anthology of short stories by Australian and Singaporean writers. Our boys went on their annual pilgrimage to Mount Carmel, to commemorate the feast day on 16 July. This annual pilgrimage spells the special relationship Josephians have with the community of Carmelite Sisters. As a community, the Josephians pray as well to offer their service as a choir for the Eucharistic Celebration in the Carmelite Convent Chapel. Bro. Emmanuel Noel, OCD, also spent some time to share with the boys about the Feast of Mount Carmel. They were privileged to have two bishops celebrate the mass at the Carmelite Convent that day. The SJI community thank the Carmelite sisters for their prayers all these years. Josephians were treated to an enriching and enjoyable experience during the week-long Learning Festival from 11 – 15 July. The theme of this year’s Learning Festival, “Learning through Play” saw students partaking in games organised by the different departments which were carried out both within and out of the classroom. In the classrooms, Secondary Three students had to complete an array of tasks which included using round paper plates to calculate the different heights of one Singapore Flyer capsule in one revolution and the other the application of technological tools and concepts of building designs to design and construct earthquake resistant model buildings using ice-cream sticks. The models were then tested to determine which designs and constructions were successful. With “Speed Book Dialing”, many Secondary One students came dressed as characters from their favourite novels. Ranging from simple peasant clothing to smart suits, students were bubbling over with excitement as they compared their outfits. Students also participated in the “Magical Gauntlet” activity during recess. They learnt to perform a simple trick accompanied by their very own impromptu story. Nyi Wai Yan Myo (LE 102) said, “Through the use of language, students learnt more about magic and how it is performed”. There was also an art activity which involved “interaction with space”. Students found the Duct Tape Photography and OP Assemblage a novel experience. "Ten in the Bag" was our very first solo performance. It was just seven Secondary Two Drama boys, ten props and two teachers. As the theme was in celebration of diversity, we unanimously decided that we would stage a play about a group of international pirates. With that in mind, we committed much of our free time to make our play a reality and to present it to the best of our abilities. Needless to say, our play, with its witty puns, sword clashing and humorous pirate talk found favour with the audience. It was a joy for us knowing that the audience appreciated this slice of drama presentation from SJI. The Prefectorial Board held a 2-day-1-night camp for all prefects on 9 and 10 July. The theme of the camp was ‘Striving for Passion’, and the camp’s activities were planned with the goal of reinforcing the passion that comes with service. The Secondary 4 Prefect EXCO also saw this as a timely opportunity for the entire Prefectorial Board to bond, regardless of which level the boys were from, as this was the first camp organised in three years. The prefects were split into nine groups, each with a mix of Secondary 2 and 3 Prefects, with two or three Secondary 4 prefects facilitating each group. The camp began with group icebreakers, which was followed by a session conducted by Mr Chong Chow Wee. Groups were allowed to share their thoughts on Mr Chong’s sharing before another session conducted by the Secondary 4 prefects. The night ended with a reflection and supper. On the second day, the prefects challenged themselves at the Amazing Race, which took them to places beyond the school campus such as the Botanic Gardens and the former SJI campus at Bras Basah. Each station explored a different aspect of being a prefect in a Lasallian school, whether it was stepping out of their comfort zone by clearing trays at a foodcourt or staging a short skit about the life of our founder. Most importantly, the Amazing Race allowed group members to work together towards a common goal. The camp concluded with a session of school songs and cheers, and the prefects left with new friendships, and a renewed passion for their role. To commemorate its 105th anniversary, the Pelandok Scout unit organised a campfire on 9 July. Scouts and guides from units all over Singapore including cub scouts from the four Lasallian primary schools, as well as old boys joined us for a night filled with fun, excitement and laughter. The theme of the campfire, ‘SJI 4 Nations’, inspired by the TV series ‘Avatar: The Last Air Bender’, was chosen to encourage teamwork and friendship. Preparation for the campfire was intense as our Pelandok scouts under the leadership and guidance of the ventures and rovers worked against the clock to build the gateway. It was one of the most ambitious structures to date with a 3-metre tall observation decks and long bridge spans. The completed tower was impressive with green and white cloth draped over the entire structure, making it a glamourous photo background. Instead of having the signature SJI green flame, four flames of different colours were lit at the end of the campfire to signify the unification of the four nations. Professor Lui Pao Chuen, the guest of honour of the campfire became the Pelandok Scout Unit’s first queen scout in 1959. The campfire was also graced by Mr Antong, the Assistant Chief Commissioner for South Area. On 27 July, five of our scouts were conferred the Chief Commissioner’s Award at a ceremony held at the Singapore Scout Association’s headquarters. Wayne Ang, Gabriel Lim, Justin Chin, Zaki Bin Zainudin and Mark Wee formed the largest cohort of CCA recipients from the Pelandok Scout Unit in the recent years. The Chief Commissioner’s Award is conferred to the most outstanding and distinctive scouts in recognition of their excellent performance, dedication as well as services. The award represents the pinnacle of achievement for the recipients and serves to prepare them for a lifetime of service to their God, Nation and Community. The journey of achieving this award includes completing the World Scout Badge, Scout Standard Badge, Advance Scout Standard Badge and First Class Standard Badge. In addition, the candidate had to plan and complete a 25 km overnight hike, attend interviews, and take up an appointment of responsibility and leadership. Alumnus and former boy scout from SJI Pelandok Scouts Prof Leo Tan (Class of 1963) was recognised for his contributions to scouting. He was among the 32 adult scout leaders who were conferred awards for their distinguished service and good work. The awards were presented by President Tony Tan Keng Yam, Chief Scout of Singapore. Read more about him here. The SJI Military Band (SJIMB) performed for the members of the public at the Istana on 6 July. Many of us were ecstatic about this as it was a first for many of us. There was a sizable crowd waiting in anticipation for our performance as we set up our stage. The SJIMB performed a variety of songs including ‘On Main Street’ by Naohiro Iwai, ‘How Train Your Dragon’ arranged by Sean O’Loughlin, the upbeat ‘My Neighbour Totoro’ by Joe Hisaishi, ‘March Blue Sky’ by Thoko Takagi. There were also popular hits, from ‘Star Wars: The Phantom Menace’, ‘Japanese Graffiti XIV’, to familiar tunes ‘Man In The Mirror’ and ‘I’ll Be There’ by the late popstar Michael Jackson. Each performance was received with resounding applause; it was clear that our music had brought much joy and enjoyment to the audience. At the end of the performance, we had the privilege of taking a photo with the President. This was truly an enthralling and unique experience for all of us! “Renaissance” is a concert held by the SJI Military Band (SJIMB) once every 2 years. This year, the SJIMB celebrated its 20th concert with the alumni band at “RenaiXXance” on 25 June at Catholic Junior College. The hard work and dedication of the bandsmen paid off as over 600 seats were sold. Bandsmen of all generations came to watch this concert, including SJI’s first drum major, Adrian Villanueva. The performances by the band was astounding. The highlights of the performance - “Japanese Graffiti” and “My Neighbour Totoro” were the clear favourites amongst the audience. The alumni band presented an extraordinary performance as well; tunes of the “Fate of The Gods” and “Deep Purple Medley” resonated throughout the auditorium. It was a glorious day for the SJI Military Band and many of the bandsmen really enjoyed themselves that day. In June this year, a group of boys and girls from both SJI and SJI International attended the biannual Lasallian Leadership Training Camp (LLTC) camp. The theme for the camp this year was ‘Step up, Step out’. It aimed to get us out of our comfort zone and to take the initiative to lead. Over the four day camp, participants had a taste of what the poor in Singapore experienced, as they also learnt how to play an active role in society and how to make a difference in the lives of others. On the first day, they were encouraged to learn how to endure and to work together to find their way around Singapore, which proved to be very frustrating for some. As they continued on with the camp, a sense of camaraderie was built amongst them and they sung their hearts out to familiar Lasallian songs. LLTC is a camp that INSPIRES the attendees to become a better leader. No one just learns how to be a great leader over the course of a few days. It is simply impossible as the best teacher of leadership is experience. On the other hand, the inspiration that LLTC provides, drives one to be a better Lasallian leader. This is what makes LLTC special. Alumni Kevin Martens Wong (Class of 2008) and Leonard Yip (Class of 2011) have been recognised for their literary efforts. Kevin's novel "Altered Straits", in which merlions are deployed as machines to fight wars, will be published by Epigram Books early next year. Kevin was one of the four writers selected from 69 submissions for the Fiction Prize longlist last year. Read more about him here. Leonard Yip is one of the eight editors who produce a magazine titled Unseen, which is aimed at spurring A-level students of English literature to explore their texts outside the pressure-cooker environment of examinations. The online magazine gives public a platform to explore the subject through creative expression. Read more about him here. Alumnus Fr Paul Pang celebrates his golden jubilee as a Redemptorist priest this year. He was ordained on 28 August 1966 at Novena Church, becoming the first local Redemptorist. Read more about him in Catholic News and in our LUMEN (December 2016 issue). The SJI Old Boys Association held its 2nd Band of Brothers & Sisters event on 4 June at the SJI Amphitheatre. 15 bands made up of current students and alumni entertained the audience over four hours, with current hits by Adele and Coldplay to oldies like Toto, ABBA and Jackson 5. We had a lively crowd including the Class of 1975 who came to support their fellow classmate Mr Jerome Tan and his band "Just For Tonight". Returning to support this event were familiar bands like Nantini & the Nuggets, Colon:D and Serendipity who performed at the same event last year. This event also raised funds for the LaSalle Kindergarden in Pothum Village, Cambodia. All the food and drinks at this event were sold by the participants of the Josephian Family Mission 2016. The food and drinks were fully sponsored by Josephians, their friends and the missionaries. The call of our Josephian mission to be men and women for others rang in our hearts, as current and old Joes reunited for a night of jamming! SJI’s social entrepreneurship club, PRISM, participated in the 11th International Donor Registry Conference (IDRC) on 2 June 2016 with a special event. The conference was organized by the Bone Marrow Donor Programme (BMDP) for delegates from 43 countries held over four high-impact days of sharing ideas and the latest developments from the world of transplantation. The international event ended with a special balloon light up by PRISM, forming the words IDRC, SG (Singapore) and GER (Germany) to represent the symbolic handover to the next host country for the 12th IDRC - Germany. The lighted balloons signify the hope and life, which bone marrow donors can offer to cancer victims. The Lasallian Concert 2016 was held in conjunction with the DBS Marina Regatta 2016 on 28 May. Talented students from SJI and SJI International rocked the scorching afternoon with their guitars and drums. SJI Guitar Ensemble, SJI International (Elementary School) Samba Band, and student bands, Colon:D and Intimate Friends brought life to the Marina Bay area with beautiful renditions of popular hits. Friends, families and alumni of our Lasallian fraternity turned up to unwind on the manmade beach at The Promontory. The event certainly gave our budding artists a bigger stage to showcase their talent and revel in spotlight. The day of the event was upon us on 27 May 2016. For five long months, through holidays and test periods, rain or shine, we had prepared for this moment of presentation and competition. Now the hall stood festooned with the fruits of that labour: rows upon rows of glamorous booths, each more eye-catching than the last. The hall was filled with excited chatter. Soon, the judges arrived and started the judging process. Resplendent with their name-tags and clipboards, they strode around the booths, praising some. The participants waited in trepidation until the judges heard their piece, then relaxed and admired their friends' projects. Soon, we gathered in the auditorium for the finals where the ten groups vied for the top prize - a partially funded trip to Le Laboratoire Cambridge in Boston. Some inventions ranged from being amazingly creative, such as the Cake Moisture Sensor while others were complex, requiring millions of dollars in budget, such as the aeroponics system for third world countries. In the end, two presentations stood out: Fabreik, a multi-purpose carpet that aims to cushion child falls and reduce parents' anxiety during their children's play. On top of that, Fabriek can also serve as an alternative and interactive platform for children to have endless amount of fun while interacting with nature. Fabriek is also eco-friendly, safe and engaging for children with its dynamic colour-changing feature that is activated by human's natural static electricity. The other group was Zhuper Slim whose product, Static Energizer, works by converting static electricity in our environment from the collision of dust into usable electricity to charge our smartphones. Both winning teams (Fab-briekers from CHIJ St.Nicholas Girls' School and Zhuper Slim from SJI) will travel to Boston for the ArtScience Innovation Workshop at Le Laboratoire Cambridge, where they will work with winning teams from other countries to further develop their ideas. Team Zhuper Slim presenting to the judges their idea and prototype on how they can convert static electricity into other forms of energy. This year's Artscience Prize is one that will not be forgotten. As Yash Bhojwani Manoj puts it, ''I really had a lot more ideas on how to improve life after attending this exhibition.'' When asked if he would do it again, he replied, ''Yes, definitely.'' All in all, a fun and creative time was had by all at the ArtScience Prize 2016. May: SJI Debate Team is among Top 8 teams in 2016 Debate Nationals! The SJI Debate Team has been ranked as one of the top 8 teams in Singapore at the end of the 2016 Season. At this tournament the individual speakers are ranked. In a field of 100 Debaters from the best schools in Singapore, Jay Parmar has been ranked 4th, and Andrew Mark Snoddgrass 6th. This is a significant achievement, especially when considering that these boys participate in debate over and above their 1st CCA Commitments. Well done, boys! When Singapore was struggling with the SARS outbreak in 2003, former director of medical services Professor Tan Chorh Chuan (Class of 1975) had to make some difficult—but necessary—decisions. Prof Tan first heard his calling to the medical profession as a schoolboy at SJI, when, as a member of the St. John Ambulance Brigade, he helped resuscitate a footballer who had collapsed during a match. In recognition of his contributions to the management of SARS, Prof Tan received the Public Service Star in 2003 and the Public Administration Medal (Gold) Medal in 2004 for his work in the Ministry of Health. Read more about him from the Asian Scientist Magazine. The spirit of community is prevalent throughout SJI; in our classes, our CCAs and our brotherhood. On 9 April, SJI celebrated this spirit at the SJI Carnival, a platform for us to bond and grow as a school, with our teachers, parents and visitors. The theme of our carnival this year was 'Ignite' and this was the 5th carnival SJI has hosted since the student-led activity first began in 2012. A total of 45 stalls sold a range of delectable food and drinks or ran games stalls that tested the participants' teamwork and problem-solving skills. An inflatable water soccer pitch brought much fun to those who enjoyed a quick splash! Though the event was interrupted by a downpour, it certainly did not dampen the spirit of the visitors who attended our carnival. Several SJI students took to the stage, charming and entertaining the crowds with their musical acts and performances. Lucky winners also walked away with prizes such as a laptop in the lucky draw. Amir Chwa (MN103) was awarded the De La Salle Excellence Award in Character by SJI Junior. Nathanael Beh (LE301), Mark Caleb Goh (MN301) and Raven Teo (FN303) were chosen by MOE for the Creative Arts Programme. Jim Seah (LE301) and Hoang Quanh Anh (MN301) were selected by MOE for the Science Mentorship Programme at NUS. Peter Andre Dumont (JC110) has been accepted for the summer programme in the Centre for Talented Youth, John Hopkins University (JHU). The fully sponsored programme will last from 26 June to 15 July 2016 at JHU. He is one of seven students who qualified for this summer programme. Chan Yu An (JC109) and Wai Yan Oo@Hsung Yuan Xing (JC104) have been awarded the 2016 A*STAR Science Award for JC students. Lie Wie Yong Jakob (FN302) was selected by HQ NCC for the International Cadet Exchange Programme at The Citadel, South Carolina, USA from 11 June to 19 June. He is one of the 10 cadets selected to participate in this prestigious programme that HQ NCC collaborates with the US Air Force Junior Reserve Officer Training Corps (AFJROTC) on. Muhammad Darwisy Bin Iskandar (FN201), Bryan Lee Tze Seng (FN303), Sean Hung Xiang Hui (MN303), and Yong Zheng Yew (JC104) have been awarded prizes by MOE for excellent performances in their 3rd languages. Zheng Yew was also awarded the DSTA JC Scholarship, in recognition of his academic ability and potential. Mahler Jacob William (ML402) has been selected by the FAS to represent Singapore in the Under-16 training tour in Bangkok. This is an affirmation of his soccer talent and skills. Lim Junying Keane (FN203), Liew Jun Yi Zac (ML301), Liew Jun Cheng Zon (ML303) have received the prestigious Singapore Olympic Foundation – Peter Lim Scholarship 2016 Awards. This award recognises the boys' sporting talent in gymnastics and academic achievement. Zac Liew was also selected to represent Singapore Schools in gymnastics at the 8th ASEAN Schools Games in Chiang Mai, Thailand from 21 to 29 July. It is an honour for Zac to don national colours and for SJI to have a Josephian in this contingent. Samuel Tay (ML401) and Brendan Loke (ML404) have been invited by Ministry of Education (MOE) to be part of the 2017 Geography Talent Development Programme (TDP) for all Singapore schools. The TDP is an annual programme organised by the MOE in collaboration with the National University of Singapore Geography Department, National Institute of Education and the Geography Teachers’ Association. It is designed to provide opportunities for capable students to broaden and deepen their mastery of Geography, and prepare a team to represent Singapore at the International Geography Olympiad. SJI athletes have run the race and done the school proud. Kyes Gaffoor (MN201) clocked 55.81 seconds to win the C Division Boys’ 400 metres gold at the 57th National Schools Track and Field Championships on 21 April. Click here to read more. Dave Tung Kin Pang (ML301) came in second with his timing of 6 minutes 48.06 seconds for the B Division Boys’ 2000m Steeplechase race. At the same event, Song Ivan (MN402) took the 4th position with a timing of 06:48.66. Dave was also placed 5th for the B Division Boys’ 1500m four days later. Click here to read more. Our C Division boys also brought home the bronze for the 4x400m relay, with a timing of 03:50.63. Click here to read more. The SJI Canoeists made history by bringing home the B Division title after 15 long years! Our C Division canoeists won the 2nd position in the annual competition. Read more in the Straits Times. The IB Group 4 project by our Senior School section is an interdisciplinary activity in which all IB Diploma Programme science students must participate. The objective is for the students from the different Group 4 subjects to analyze a common topic or problem. The exercise is a collaborative experience with the emphasis on the processes involved in such an activity, rather than on the product. This year, the theme is "SJI Through the Lens of Science". The students went through a planning stage before the actual day of photography on 27 April, where they went around the campus capturing relevant photographs associated with the SJI Bishan campus or experience. They then presented their photographs on posters, with a scientific story. The photo exhibition was held in the Senior School section on 29 April, from 3.30pm to 5.00pm. Students and teachers got to cast votes for their favourite posters. The best posters will be displayed in the science labs in the new Malcolm Road campus. Here's a sneak preview of some of the exciting posters that show how science can be seen through photographs. Lan Yiduo (ML303) is passionate about music. He recently participated in some local music events for young people in Singapore. The first event was the Forum for Young Composers 2016, a platform for young music enthusiasts to compose and have their works read and shared with the public. Listen to his composition "Prelude: Dramatic Theme" performed by a quartet. He also attended a workshop on 新谣 (Xīnyáo), a genre of songs about life in Singapore, which are composed and sung by Singaporeans. The workshop was a platform for youths who wish to improve their music composition skills to interact with the renowned musicians in Singapore. At this event, Yiduo had a chance to perform his song for the musicians and hundreds of students who attended this event. These events provided Yiduo with many opportunities to improve his music composition skills, and to make new friends who are passionate about music. Click here to read the story by LianHe ZaoBao. Green is the new black! This phrase marked the start of Earth Week in SJI. Being green is cool, literally, especially with the recent spate of dry and very hot weather. SJI Green Club put up a myriad of activities around the school to mark Earth Week. It started with a display of books regarding the environment and some samples of upcycling items from teachers in the library. The Green Club also worked with agencies like the National Parks Board (NParks) and World Wide Fund for Nature (WWF) to put up a series of panels in the canteen to educate everyone on Singapore’s natural heritage and a talk on climate change. There were fun activities like a skit on the Conference of Parties (COP) 21 and a quiz on climate change. We ended off the week with a prize presentation on Earth Day (22 April 2016) for an inter-class “Design-A-Recycling Bin” contest. It is heartening to see all of us, students and staff, NParks, WWF, coming together as a green community to love the only planet we live in. The Unit Overall Proficiency Award (UOPA) is an annual award presented to NPCC Units in the whole of Singapore in recognition for their hard work and dedication. This award is presented at four tiers. Through sheer determination in the face of insurmountable challenges, our NPCC Unit clinched Gold, for a commendable sixth consecutive year, the first time in our Unit's longstanding history. In order to attain this award in the top tier, the Unit must attend, plan and compete in a wide array of events and competitions over the course of the year, all of which are essential to a cadet's holistic development. Every NPCC Unit develops cadets' hard skills in mainly two areas: drills and camp craft. Many people perceive drills as dull, boring and even inhumane. Practicing drills instills in our cadets the values of teamwork, discipline and resilience. Perfection is only achieved when a contingent of cadets have these three values: working as a team; having an imperturbable mindset; and a never-say-die attitude. These are what our cadets will benefit and take home from those countless hours of practicing drills. Campcraft teaches dexterity and inculcates a sense of meticulousness. The demands of campcraft is nothing short of colossal: the need to always achieve the maximum tension and at the same time make structures look neat and tidy is no easy task. One needs to have a constant drive to make improvements and also be skillful in using the best possible solution to solve problems. These two hard skills are heavily emphasized in our Unit, not only to equip our cadets with them, but also to instill these invaluable characteristics in them. Over the course of the year, our Unit participated in the .22 Marksman Shooting Competition, the X-Challenge Competition and the bi-annual Campcraft Competition. In each competition, we did much better than we had expected; by being in the top 50% of Units in the X-Challenge Competition and almost managing to break into the top 20 in both the .22 Shooting and Campcraft Competition. This would not have been possible if not for our cadets who had the right attitude to train and always aim to do their best, giving their full concentration and effort. Competitions are not only meant to make a name for our Unit in NPCC, but also to give our own cadets recognition for their various skills and abilities, giving cadets the chance to represent our school in these competitions. Apart from just drills and campcraft, our Unit also aims to develop our cadets and equip them with other skills. When cadets first join the Unit in Secondary 1, they are all required to submit a certified swimming certificate, to show that they have the basic abilities to swim, and in doing so, are awarded the Swimming Life Skill Badge. This is the essential first step in developing our cadets further in the area of Life Skills. Other skills like kayaking, sailing and life saving require one to be able to swim. Our Unit is keen on developing our cadets to be certified kayakers; we allow all Secondary 1 cadets to join a 1-Star Kayaking course. Not only does this add another skill to their personal development, but it also helps them to build a sense of camaraderie through this course, by fostering closer friendships amongst themselves. Our NPCC Unit also participates in Camps organized by our HQ, for example, the Adventure Training Camp (ATC) for Secondary 2s, and the Survival Training Camp (STC) for Secondary 3s. These camps impart different values to cadets. The ATC introduces cadets to camps in NPCC, teaching them how to ration and to value togetherness. As the activities bring cadets out of the campsite, they learn to look out for one another and to ensure everyone will be safe. The STC focuses more on leadership skills and outdoor survival skills. With activities designed to instill proactiveness and awareness in cadets, this is a very useful camp to help our cadets who are stepping up into their leadership roles. Our Unit also organizes our own Unit Training Camp, which aims to change the mindset and attitude of our cadets, and to shape them to be capable leaders who will make positive changes. Additionally, our Unit also participates in different ad hoc events such as our annual Area Games Day, where all schools in Area 15 come together to have fun and to play games, with each school facilitating one game. The main objective of the event is to strengthen friendships amongst cadets from the different schools. It also provides an opportunity for cadets to build bonds with their juniors and seniors through games. This year there were two extremely significant events that took place. The first was the SPF-Badge Award Ceremony. The Singapore Police Force (SPF) Award is the pinnacle award that a NPCC Cadet can attain in his NPCC journey. Being awarded this prestigious accolade is no easy feat, as cadets have to go through two rounds of interviews, one at an area level and one at a HQ level. Two of our cadets, SI (NPCC) Tan Yi Long and SI (NPCC) Lim Ji Xuan, received this coveted award. The second event of utmost importance is the National Police Annual Parade. During this Annual Parade, awards are given out to those Units that have been awarded Gold for the UOPA. During the parade, we are also proud to have four representatives, with SGT (NPCC) Raven Teo who was the flag bearer for SJI. This award was only possible through the blood, sweat and tears from our teachers and cadets. Everyone in the Unit had a part to play in helping us achieve this award. The SJI Guitar Ensemble collaborated with the School of Science and Technology to present a concert - "Lyrics & Notes" at the SIM Performing Arts Theatre on 16 April. The students showcased their talent as they charmed the audience with their delightful tunes and melodies. Besides the guitar ensemble from the two schools, there were also performances by SST's Show Choir. Catch a glimpse of the boys' performance here. On 13 and 14 April, SJI's Drama Club presented an original adaptation of "Animal Farm" that was captivating, creative and convincing! "Animal Circus" is a gem in this year's calendar of the arts in SJI! Well done, Josephians! The SJI Vocal Ensemble joined the choirs from Dunman Secondary, Crescent Girls' and Catholic Junior College to present an evening of choral music on 11 April. Our boys sounded superb even when the stage lights and mics didn't work this evening at the rented auditorium. Listen to them sing "O Fortuna". The Anniversary Parade is the most important parade of the year for all SJI's Uniform Groups — NCC Land, NCC Air, NPCC, St Joseph's Pelandok Scout Group, St John Brigade and SJI Pipes and Drums. Held once a year, this parade marks the stepping down of the Secondary 4s and the passing down of authority and command over to their Secondary 3 successors. It also recognises the contributions made by certain cadets who have done exceptionally well in their CCAs, and our teachers who have dedicated years of their lives in service to their respective CCAs. Colonel Percival Goh was invited to be the guest-of-honour for our 164th our Anniversary Parade. As the Chief Signal Officer of the Singapore Armed Forces, Colonel Goh has dedicated 26 years of his life to serving his country in the SAF. He is an old boy who studied in SJI from 1984 to 1987. He was SJI Military Band's Drum Major in 1987, and participated in numerous events such as the Singapore Youth Festival. He is a true Lasallian who serves and protects his country, and he still treats SJI as his home despite having graduated almost 30 years ago. Catch our Uniformed Groups in action as they performed their annual march-past at the parade in our Photo Gallery. A day where we prayed, reflected and celebrated. SJI celebrated Founder's Day on 8 April with Brother Gregory Thomas Lim, FSC, Dean of Lasallian East Asia District (LEAD), as our Guest of Honour. Awards were presented to students who had achieved outstanding performance in academics and sports. Catch the exciting moments of that day in our Photo Gallery. SJI celebrated International Friendship Day on 5 April. It aimed to raise awareness of our geo-political realities inherent to Singapore. Josephians donned their traditional costumes and watched an entertaining skit conducted by international students about how they build up friendships. The Parent Support Group (PSG), working with SJI parents, also offered snacks such as brownies, chocolate eclairs, popcorn, ice cream sandwiches, and Subway cookies at affordable prices. The net proceeds went to a worthwhile cause, HopeHouse. HopeHouse was set up in 2011 and is located within the premises of the LaSalle Brothers. HopeHouse was set up to help male youths who face the challenges of alcohol abuse, aggression, bullying, theft, gangsterism, neglect, abandonment, and unhealthy living conditions. HopeHouse provides an alternative conducive environment and a new beginning for the youth to help them overcome their challenges and to enable them to grow to their full potential. The SJI PSG presents the cheque of $2000 to HopeHouse, received by Bro. Collin Wee, FSC. Five science students - Gabriel Yong (JC 104), Isaac Khoo (JC 109), Sheares Toh (JC 101), Sin Ren Xiang (JC 106) and Santhosh Dave Kalaimaran (JC 107) - represented SJI at the Young Defence Scientists Programme (YDSP) Congress 2016. They showcased their research projects, done in 2015, in a poster exhibition at the Congress. The Congress was organised by the Defence Science and Technology Agency (DSTA) and the DSO National Laboratories. Gabriel and Isaac were selected to present their research to Minister Ong Ye Kung, the guest of honour for the event. Nicholas Sim Yung Ern (ML302) was awarded the YDSP Scholarship. He is among 32 recipients of this scholarship. The scholarship is awarded to IP Year 3 students who have outstanding academic results in Sec 2 in 2015 and a passion in Science and Technology. Permanent Secretary (Ministry of Home Affairs) Mr Leo Yip Seng Cheong (Class of 1979) will be concurrently appointed as Permanent Secretary (Prime Minister's Office) and Permanent Secretary (National Security and Intelligence Coordination). Mr Gabriel Lim Meng Liang (Class of 1991) who is currently the Chief Executive Officer of Media Development Authority, will be appointed Second Permanent Secretary, at Ministry of Communications and Information. He will concurrently be the co-Managing Director (Designate) of the Infocomm Development Authority of Singapore. Lim Bo Zhi (Class of 2012) overcame the death of his parents during his teenage years, in the midst of his secondary studies. Orphaned at 18, Bo Zhi, who is an only child, did not have any close relatives he could turn to. Despite this, the 21-year-old computer engineering student topped his cohort and will graduate from Singapore Polytechnic with a near-perfect grade point average (GPA) of 3.94 out of 4.0 in May. He was part of the poly's peer-tutoring programme, where he coached weaker students taking the same course. Bo Zhi also organised an overseas community trip with schoolmates, where they built toilets and taught English to village children. He also volunteered for 10 months at a family care centre, giving tuition to primary school pupils once a week. He credits his achievements today to Ms Christina Tang-Lien, SJI's senior counsellor, whom he regards as family. Bo Zhi become one of the 22 Model Student Awards recipients given out by Singapore Polytechnic. Read more about his story here. On the eve of Good Friday (also known as Maundy Thursday), the SJI community came together to commemorate the Last Supper of the Lord. The Thursday morning assembly began with an unusual sombreness, as Josephians witnessed the humbling act of the washing of the feet of students by the school leaders. This was to remind us of the humble act of love and service by Jesus to his disciples at the Last Supper before his crucifixion. The Catholic boys then continued their reflection of the Lord's Passion in the evening at the Eucharistic Mass and washing of the feet by Fr Adrian Danker, SJ. This was followed by visitations to various churches around Singapore. Many of the students were grateful for the church visits as some of them have never visited the churches beyond their usual parishes. The boys also camped overnight till Good Friday morning, where they walked the Stations of the Cross, before ending the vigil with a service. The school community rejoiced on Easter Monday morning, as they gathered to celebrate the Lord's Resurrection, with songs, blessings of holy water and Easter eggs, a symbol of new birth, new life. Alleluia! The Lord is Risen! During the Lenten season, the students from Secondary 1 to 4 embarked on different service projects, as part of their Religious, Moral, Social Education (RMSE) programme. This helped them to learn to be men for others. The Sec 4 boys met with the families of the one-room HDB flat dwellers living in Toa Payoh Lorong 6. The boys rendered their services by cleaning these homes and providing essential foodstuffs, bringing much joy to these families during the Eastertide. The Lasallian family gathered in SJI for the first Lasallian Formation Day on 11 March. About 750 staff members from the Lasallian schools had a choice of bonding over games of football, frisbee, Captain's ball, floorball or a mass aerobic workout, or completing a 2.2km or a 4km run around Bishan Park. It was a challenge put forth to the Lasallian family to accomplish a symbolic run of 1651km, the number being the birth year of our Founder, St. John Baptist de La Salle. Even though the 1651km challenge could not be accomplished within the short timeframe, what mattered was the camaraderie and spirit of the Lasallian family where everyone could spend a fruitful and enjoyable time together. The SJI NPCC Unit and Scouts Unit collaborated and embarked on a hike from SJI (Bishan) to SJI (Malcolm Road) on 3 March, where they interacted with the workers who are helping to renovate our school campus. The intention of the hike was to foster the spirit of community between the boys from the two Uniformed Groups. The values-in-action (VIA) component was to give the boys a platform to serve the people who are serving us: the workers who are renovating our school. For the VIA activity, one student was paired up with one worker. They ate and talked with the workers, lending their ears to them. The interaction with the workers held a very special meaning for everyone. During the hike, many of the boys struggled under the hot sun, walking a total of 6.1 km to SJI (Malcolm Road). The VIA activity made us realised that no matter how hard the hike was, it could never compare to the workers' struggles; waking up as early as 5am to come to work, and carrying heavy construction materials for more than 12 hours everyday. Strangely, during the conversations, the workers did not complain but instead seemed very thankful for what they have earned, no matter how little or how hard they had to work for it. They were extremely selfless, sending back money to their homes even when they probably did not have enough for themselves. They may not have been in a Lasallian school, but they surely live out our three core values. Faith: in things to turn out well and hopefully their families will benefit from their hard work. Service: although the intention of the VIA activity was for us to serve them, the workers served us instead, opening our eyes and minds, as they shared with us their personal experiences and teaching us so much more than we can ever give to them. Community: the workers did not know our students at the start, but they conversed and interacted with an open heart, allowing the boys to hear parts of their lives. SJI's C-Division boys attained the 4th position in the Tennis national finals after 20 years. The boys defeated Victoria School and SJI International (SJI: 5 - SJII: 0) in the group stage before advancing to the semi-finals, where they played against ACS Barker (ACS: 4 - SJI: 1). Well done, Josephians! SJI mourns the passing of our alumnus, Fr Robert P. Balhetchet, a diocesan priest in Singapore. Fr Balhetchet passed away on 15 March 2016, at the age of 77. An old boy of SJI, he completed his secondary education in 1954, before he was enrolled in the Minor seminary in the same year. He was ordained on 26 January 1964. After his ordination, Fr Balhetchet was appointed Assistant Rector of the Cathedral of the Good Shepherd. He was awarded his doctorate on ecclesiology at the age of 37 and was sent to teach at his alma mater, College General in Penang. Fr Balhetchet played an important role in Singapore Education. He was instrumental in the planning and conceptualisation of moral education in Singapore schools. In October 1978, the late Dr Goh Keng Swee, then Minister for Education and Deputy Prime Minister, convened the Moral Education Committee in response to concerns about the state of moral education in Singapore. At age 39, Fr Balhetchet was put in charge of preparing the curriculum and teaching materials for a revised national moral education programme, which resulted in the introduction of the "Being & Becoming" programme and also led to the Good Citizen (好公民) programme for primary schools. While working on the same programme, he returned to Singapore in 1980 to serve as the Rector of the Cathedral. He was also a member of the planning committee behind the building of the St Francis Xavier Major Seminary in Singapore, and the chaplain of the Carmelite Convent. Fr Balhetchet celebrated his Sacerdotal Golden Jubilee in 2014 at the Church of Our Lady Queen of Peace. His wake is held at the same parish. The Funeral Mass will be on Saturday, 19 March 2016 at 9.30am and celebrated by His Grace Archbishop William Goh. Please refer to the chancery notice for details. May eternal rest grant unto Fr Robert Balhetchet, O Lord, and let perpetual light shine upon him. May he rest in peace. During the BNP Paribas WTA Finals held in Singapore last October, 42 ball children aged between 12 and 18 were officially inducted during the programme. Russell Kwong (MN 301) was one of them. He was selected from 200 applicants, after a selection process and a compulsory training camp. Russell was also a ball boy at the SEA Games in June. A good ball boy working at an event of this level must have several characteristics such as agility, speed, accuracy, and above all, character. They must be committed to serve the players first. They must be able to roll the ball smooth and accurately and should not lose focus. They should also be cognisant of the movement of other ball kids on court. Russell was recognised for having these. With perseverance and determination, Russell went on to win the prestigious Top Ball Boy Award. He represented Singapore as a ball boy in the Australian Open from 8 to 22 January. Our warmest congratulations to Russell for winning this award! Top photo: Russell (circled; in the back row) with other ball children. Josephians turned up at Bishan stadium on 4 March in their bright house colours and with their mascots to represent their fraternities at the annual track and field championships. They ran, they jumped, they threw. They cheered, they smiled, they got tanned. They had a great time at the SJI Sports Day! SJI boys beat Woodlands Ring Secondary (WRS) 4–0 in the National B Division Hockey Championship for an opening victory in the second round. At the match held at Sengkang Hockey Stadium,on 2 March, both SJI and Woodlands Ring had qualified for the second round after a 2–1 win-loss record each in the first round. Andre Rodrigues (#10) scored 2 goals, while Rizk Dagfal (#12) and M Danish B Md Azmi (#7) scored 1 goal each. This win effectively strengthens SJI’s chances of qualifying for the semi-finals, as the top two teams in each of the Round 2 group standings will go through. A win for SJI when they meet VS in their next game will seal their semi-final spot. Click here to read more. The youth category of Singapore's inaugural Catholic art prize, the Angelico Art Prize, was won by alumnus Calvin Aditya (Class of 2014) on 26 February. Fellow alumnus Anthony Halim (Class of 2014) also exhibited his painting, "Conflict". The Angelico Art Award is the first thematic Christian art prize in Singapore. It seeks to promote creative endeavours through the integration of art and faith. The theme for the 2016 art award is ʹWho do you say I am?ʹ (Matthew 16:15). The 2016 Angelico Art Award Exhibition was held at Triple.Two Artspace at Queen Street from 27 February - 6 March 2016. Calvin has generously donated $400 from his prize money to SJI, in appreciation to his alma mater which had played an immense role in his development as an art student. Left: Calvin with Fr Adrian Danker and Mrs Vivian Tan (HOD, Arts) in front of his winning entry, "Ascension". SJI commemorated Total Defence Day on 12 February, with the theme "Together We Keep Singapore Strong". We are proud that Colonel Mike Tan, an old boy, was present to share his experiences and views of Total Defence and its importance. He shared about being stationed in Indonesia in 1998 during the May riots; and how it relates to our Total Defence. The whole school enjoyed his sharing during assembly. It was a privilege to have Colonel Tan to spend time with his alma mater on this day. The Inaugural Service is the first formal school assembly for the academic year where the entire school community gathers together to celebrate its sense of being in a Lasallian community. To mark the beginning of the school year, the SJI community officially welcomed the newest additions to the school – students from both Secondary 1 and JC 1, and members of the teaching and non-teaching staff at the Inaugural Service. Fr Adrian Danker reminded the school that all it will do this year will be in God's holy presence. All have the task of celebrating this truth by sharing the gift of themselves with each other. The Inaugural Service concluded with a traditional lion dance performance and blessing of oranges, as part of the Lunar New Year celebrations. January: Seniors, Welcome to SJI! 31 January 2016, a date that marked the start of a brand new journey for the newest members of the Josephian family – the Year 1 students at the Senior School. Based on the theme ʹAfresh, A familyʹ, the J1s, led by their ever-passionate Orientation Group Leaders from the senior J2s, played, sang and cheered their hearts out over the five days. They participated in activities ranging from ice-breaking sessions, to the Amazing Race that called upon the J1s to display teamwork, the House Games where the passion for their Fraternities was on full show, and the Mass Dance where the J1s danced and swayed in tune with each other. The J1s also learnt about SJI through the Heritage Trail, visiting stations to learn about SJIʹs values, as well as the significant people and events in the rich history of the school. They were introduced and taught about SJIʹs culture of service, why and what it meant to be Lasallian. Special time, too, was allocated for the J1s to consolidate all that they had learnt and experienced with their Tutorial Groups in Peer Support Sessions. The Nightwalk was a time of serene and meaningful reflection of their growth during Orientation, as well as a sharing of their hopes and dreams for the upcoming two years. Senior School Orientation 2016 culminated in a campfire, in which thunderous cheers and singing filled the air. The orientation camp is not the end but the beginning of a wonderful journey for the J1s, as they continue to bond with their seniors and batch mates alike, whilst experiencing the Josephian community, and discovering for themselves what it means to be Josephian. The Secondary Two boys started their new academic year with ACE Camp at the sunny island resort on Pulau Ubin. The boys were engaged in numerous outdoor activities from cycling to orienteering, and kayaking. Many boys picked up a new skill or two, or uncovered their hidden talents. During these days away from their usual comforts of city life, they went through the 'floods and furnace' of life, as they learned to live and survive in the outdoors. Friendships were strengthened and brotherhood forged – ties that will remain with them for a long time to come. ACE Camp 2016 helped our boys to become young men, and to learn to appreciate the finer and simpler things in life. So much joy for our Secondary One boys this week: they had their SJI badges pinned on their shirts for first time by their Seniors, and they participated in a "rocking" campfire to end Orientation and to welcome them as Josephians. Many parents were on their feet singing too! Truly the SJI Spirit is alive and resounding! All our Secondary boys qualified for Junior College (JC), Millennia Institute (MI) or Polytechnic, with 96% qualifying for JC. 99.7% of candidates obtained at least 5 GCE ‘O’ passes. SJI achieved a distinction rate of 59%, with 133 boys obtaining 6 or more distinctions. SJI celebrates two of our top scorers – Gerald Neo (FN 402) and Camagni Fabio (LE 401) who came in with low PSLE scores and have now scored 6 and 8 points respectively. Well done, boys! The Secondary 3 students and teachers spent three days at the annual Camp Taba (Together and by Association) during the first week of the new school year. They got to know each other and their teachers, learnt about themselves, appreciated nature and and built community. An excellent start to a new school year! SJI congratulates the 80 students from the Class of 2015 who collected their International Baccalaureate (IB) examinations results on 5th January 2016 at 12pm. SJI achieved a 100% Diploma pass rate, with the average score being 40.7 points out of a maximum of 45 points. Four students achieved a near perfect score of 44 points. Three students were also awarded the prestigious Bilingual Diploma. Also, 36 students (45% of the cohort) achieved at least 42 points and 57 students (71.25%) scored 40 points or above. The Class of 2015 is SJI’s second batch of students who were admitted in 2014 for the 2-year IB Diploma Programme (IBDP). The SJI IBDP focuses on rigorous academics coupled with character development and values education. The IB Diploma, as an alternative to the GCE ‘A’ Levels, is valued for its holistic curriculum and strong focus on independent learning and thinking for university studies, the work place and the all-round development of young people for a fulfilling life. Its strong emphasis on internationalism, intercultural understanding and making a positive difference to the world fits well with the mission of SJI. As a Catholic and Lasallian school, SJI is committed to developing every student’s character and to helping them realize their academic potential, so that they become men and women whose education empowers them to make a positive difference in the world. The IBDP results of the 2015 cohort are an affirmation of the quality of the balanced and holistic education offered at SJI.